This thriving town rests on the shores of the Mediterranean Sea. It is a privileged location both geographically and for its climate. It is situated at only a thirty minute drive from Malaga International Airport and Malaga City itself. It is within easy reach of Ronda, Gibraltar and Antequera and only a two hour drive from important Spanish cities such as Granada, Cordoba, Cadiz and Seville. This Mediterranean wonder contains so many contrasts, such as mountains and sea, village and town, work and play. These contrasts make everyone feel at home. No-one is a stranger here. Luxury and austerity, business and pleasure, the modern and the old all walk hand-in –hand making Marbella an exceptional place. Open, cosmopolitan and awaiting your visit. 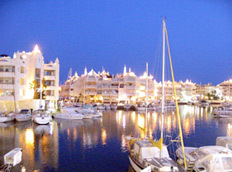 Marbella has hosted numerous world tennis, nautical and golfing tournaments. To some it is known as golfers paradise. Nerja is on the seashore some 50 kilometres from Málaga on the N340 coastal highway, and marks the eastern tip of Málaga's Costa del Sol. Once a sleepy fishing village, the town now has a population of over 12,000. 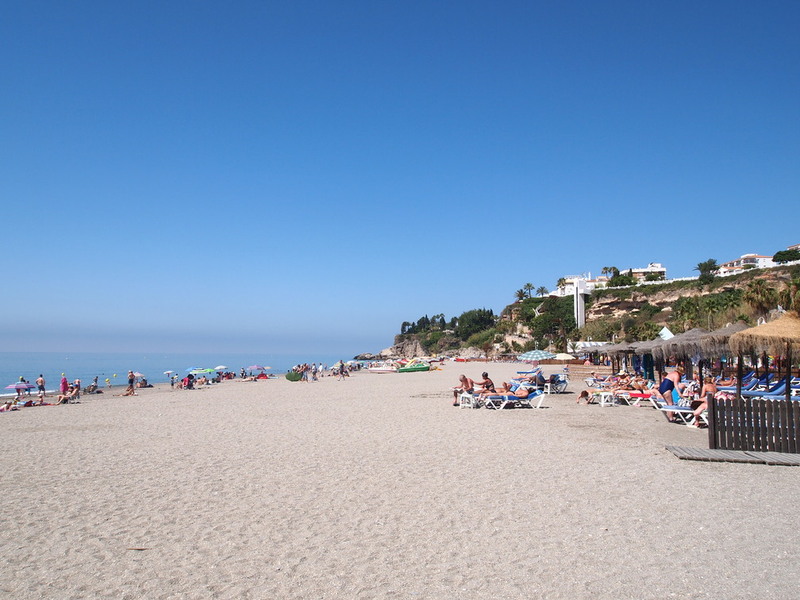 Nerja boasts 16 kilometres of beaches with powdery sand and sparkling clear water. All major water sports are available here, including water skiing, scuba diving and sailing. Flanked by a dramatic mountain range, Sierra Almijara, to the east, the town has, fortunately, managed to avoid being blighted by the concrete high-rise scenario which has been the inevitable result of the tourist boom in some of the coastal resorts. The old quarter of the town is still virtually unchanged with narrow, winding streets, whitewashed houses with wrought iron terraces overflowing with geraniums, on which a canary can sometimes be heard singing. However, the heart of Nerja is its spectacular Balcón de Europa, the "Balcony of Europe", a magnificent promenade along the edge of a towering cliff, once the site of the great Moorish castle, with sweeping panoramic views of the Mediterranean and the small coves and beaches below, against an awesome backdrop of hazy blue mountains. There are plenty of restaurants and cafes here to choose from, and the visitor can hire a horse-drawn carriage to explore the most romantic corner of the town. The town's monuments include the 17th century Church of El Salvador, in a style which is a charming mixture of baroque and Moorish, or mudéjar, and the beautiful Gardens of Capistrano Playa, which descend to Burriana Beach. However, Nerja's most spectacular attraction is undoubtedly its fascinating caves, located just three kilometres from the centre of town. They include archaeological treasures such as paintings over 20,000 years old and other pre-historic remains. One of the enormous natural caverns has been transformed into a concert hall, where many performances are staged during the summer. 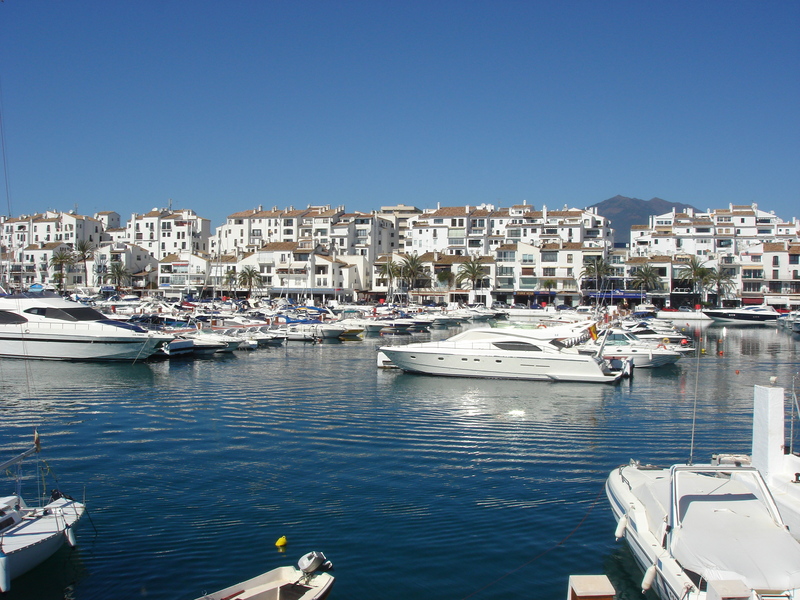 Puerto Banus is located just west of Marbella, before you reach the small town of San Pedro de Alcantara. This is the place to be pampered yachtside and ogle those fabulous luxury yachts while sipping a drink at one of the many open air restaurants and bars. The setting is close to ideal, with its impressive mountain backdrop and ocean views. Since its inception some forty years ago, the port has steadily grown and now features a casino, commercial shopping centre, a Corte Ingles department store, marine observatory and a multi cinema with films shown with their original soundtrack. Nightlife buzzes at Puerto Banus with your choice of alfresco bars, piano clubs and discos while during the day this is a window shopper´s dream with several of the world renowned fashions houses featured here, in addition to small, interesting shops and boutiques. Copyright © 2019 Gill Johnson Holidays - All Rights Reserved.